Hortus Camdenensis | Iris subbiflora Brot. A hardy, evergreen rhizomatous iris with leaves to 30cm long and 2.5cm wide. The flowers are violet, coarsely veined brown and purple, with bluish beards, shading to dull yellow. [RHSD, Hortus, BIS]. ‘This is perhaps the finest of the dark-flowered species hitherto introduced. It is a luxuriant growing kind, of rather diffuse habit, reaching from one and a half to two feet in height, with broad sword-shaped leaves and large rich deep purple blossoms, nearly six inches in diameter’. [Gard. Chron. 1854]. ‘A plant entirely distinct from the biflora of Linnaeus, the specimen of which (as deposited by him in Clifford’s Herbarium) is now in the possession of Sir Joseph Banks. That has several flowers, with the tube of the corolla several times longer than the germen, and is altogether a far smaller plant, approaching very near to pumila; of which perhaps it is a mere variety; and most likely not a native of Portugal. From germanica our species differs on the other hand, in being smaller, in the black-red colour of the corolla, in fragrance, in having a simple and generally one-flowered stem, instead of one with branches and several flowers; as also in having a cylindrical, and not a trigonal germen; the leaves are also of a yellower hue. The stem is from half to a foot high. Grows in chalky spots near Lisbon. Sir Thomas Gage was kind enough to permit us to examine a part of his herbarium, where we found a specimen of it, gathered near the above city by himself. It very rarely has two flowers; and not one plant in six hundred, according to Brotero, has three. Our present specimen had been cultivated in the same garden for fourteen or fifteen years, and there it was never seen in bloom before last May. Subbifera would have been a more appropriate specific name than subbiflora; the circumstances of the same root sometimes throwing up flowering stems, at different seasons of the year (spring and autumn) being what was intended to be expressed by it. By the Portuguese it is called the Red Iris. The corolla is very like to, but smaller than that of germanica. It is by far the most fragrant of the genus known to us. Is said to vary with pale sulphur-coloured flowers. 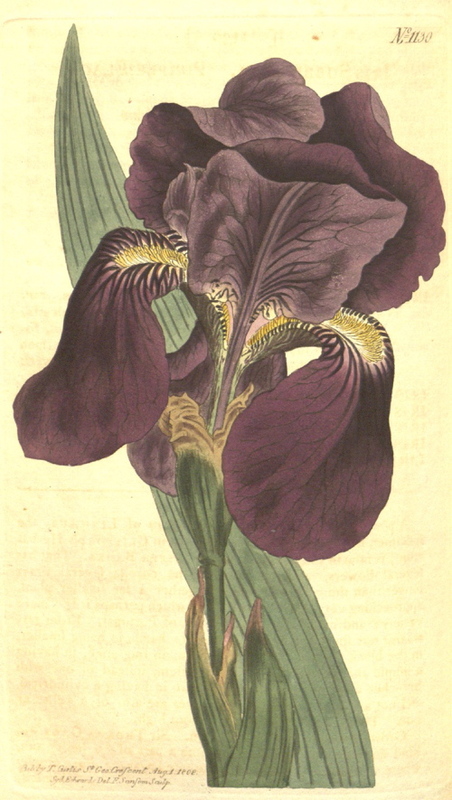 Seems to have been known to the older Botanists; but we never met with it in bloom till now.’ [BM t.1130/1808]. Introduced to Britain in 1596. [JD]. Listed in all published catalogues [B.255/1843]. Iris lutescens Lam. ssp. subbiflora (Brot.) D.A.Webb & Chater.